Hopes for strength and a more harmonic future were largely behind the decision by leaders of Norway’s largest music festival, “Øya,” to let a large US investment fund take it over. The acquisition offers more proof that festivals have become big business. News of the acquisition was released just as Øya was opening for its annual four-day run in Oslo on Wednesday. 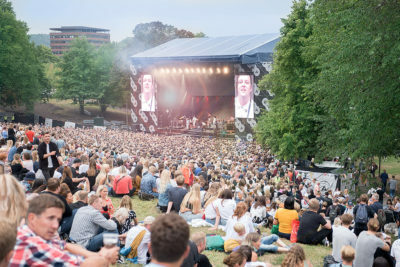 The US fund Providence Equity Partners, which has shareholdings worth an estimated USD 58 billion, has bought Øyafestivalen through its Superstruct Entertainment group for an undisclosed amount, marking its third recent investment in European festivals. The deal makes Øyafestivalen partners of sorts with the large Spanish electronica festival Sonar and the Hungarian festival Sziget. It comes as festivals all over the world are facing much higher fees charged by artists seeking higher income from live performances in the new streaming age. Claes Olsen, an owner, founder and booking chief of Øya, stressed that he and his four partners have a management agreement for the festival that “gives us full control over operations” just like they’ve had so far. “We want to preserve Øya and maintain the development we’ve had, and that’s what we’re best at doing,” Olsen told DN. “One of the big advantages with this for Øyafestivalen is that the risk no longer will rest with just five individuals,” Olsen added. He and co-owner-founder Linn Lunder promised that the festival will continue to be a Norwegian company, operated by the same management and with the same profile it has built up over the past 19 years. Lunder claimed the Providence fund was attracted by Øya’s entire profile that’s based on environmental- and climate-friendly operations, food and drink that’s gone far beyond sausages and beer, and social consciousness in addition to all the music. With more than 15,000 paying ticket holders every day plus nearly 3,000 volunteers who receive free festival passes, Øya ranks as Norway’s largest festival. It’s also been the most profitable, even though results were modest at best last year. DN reported that the festival generated revenues of NOK 76.7 million (USD 9.6 million at current exchange rates) last year and was left with a pre-tax profit of NOK 2.5 million. That was down by NOK 1.2 million from the year before. “I don’t think folks are aware of the enormous risk there is with festival operation,” Olsen told DN. “Things are beginning to be very expensive and operating margins are minimal. A rainy day can cost a lot.” It was actually raining when Øya opened on Wednesday, after three months of record high temperatures and hardly any rain at all. More rain was forecast for Friday. Olsen and Øya’s other founders and co-owners have secured themselves ownership stakes in the fund’s Superstruct Entertainment, but won’t reveal how large their stakes are. Private equity funds like Providence are generally known for buying up companies to restructure and develop them and then sell them at a profit. It thus remains unclear how long Providence’s ownership will last, but one of its managers told news bureau Reuters last year that Providence intends to build up a portfolio of festivals that can form a network, cooperate and expand internationally. “We had looked at many possible forms of cooperation, and several international players have expressed interest in us,” said Lunder. “We are very satisfied with the choice we have made.” DN reported that festival’s acquisition won’t affect its prospects to also obtain state financial support to subsidize its operations. It attracted NOK 1.7 million this year, while Culture Minister Trine Skei Grande said she had confidence in the festival management’s “strategic decision” to secure the festival’s national and international position in the future.